Order dictates Tucker Carmichael’s life—his orders. On a cattle drive, a moment’s hesitation can mean death. The Chisholm Trail is dirty, dangerous, and no place for women. After years at school, Jessalyn Culpepper has come home and is determined to show everyone that a woman can manage everything from cooking to cattle—whether they like it or not! Tucker tries to manage his partner’s headstrong sister, horrified when she wants to join the cattle drive. But when they need a chuck wagon cook, Jessalyn seems the only solution. Will God stir up love along a trail filled with their Plots and Pans? This book releases on April 1, 2014, but you can pre-order here. Jessalyn (Jess) Culpepper grew up on the Bar None ranch, but her daddy sent her overseas to finishing school, hoping the headmistress could offer what the ranch could not: a female’s touch. Tucker Carmichael feels responsible for Jess after promising her daddy on his deathbed that he’d look out for her. Of course, he’d made that promise while she was safely ensconced at boarding school on the other side of the world. Now that she’s back on the ranch, keeping that promise isn’t so easy. Especially since Jess is headstrong and stubborn, and harbors a deep desire to belong. I could easily relate to Jess and Tucker, but I would have found their romance to be more believable with less sparring and definitely with more physical tension. Gentle spiritual nuggets like this trickled throughout the story, seamless and natural, and deeper issues made me pause and reflect. The slang tended to weigh the story down a bit in places, but all in all, Plots and Pans is a solid read and a great taste of what’s to come with Shiloh Run Press. If you enjoy clean, historical romance with strong characters and a gentle spiritual thread, you’ll want to scoop this one up. Disclaimer: Sending a big thank you to Shiloh Run Press/Barbour Publishing and NetGalley for allowing me the privilege of reviewing this book. 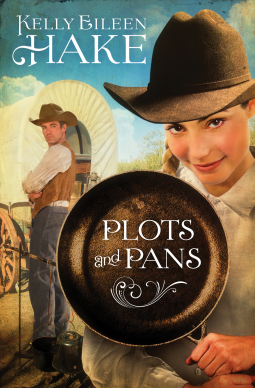 I received a free copy of Plots and Pans in exchange for my fair and unbiased review. This opinion is my own, and I received no compensation. ← Have you tried PicMonkey?